Posted November 19th, 2018 by Codastar & filed under General News. 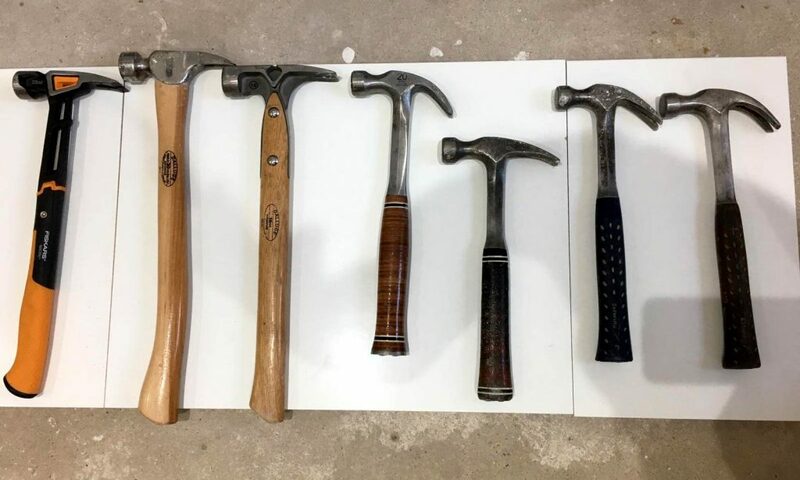 Hammers, you would think they are essentially the same but through our own individual experiences, we have all got our own preferences when it comes to the old knocking stick. Here is a some information on the hammers we each carry. Made in titanium with a hickory handle, this hammer is super lightweight and allows a faster swing, delivering greater power at point of impact with less stress and arm fatigue than a steel hammer. It a has a strike guard to protect the hickory handle improving the lifetime of the handle. It also features a Sidewinder™ Nail Puller providing extra leverage for removing nails without ripping up forms. Claws on the hammer are reinforced to provide increased strength for prying. By far the most expensive hammer but a very effective tool! Leki also owns a 20 oz steel handle Estwing hammer. This hammer has a precision cast, full polished steel head. NaiLoc® magnetic nail holder provides one hand nail starting and increased reach. With a 17in curved American hickory handle, that has been ergonomically designed, improving balance while reducing shock transfer. The hammer has a smooth face allowing use in other tasks not just as a framing hammer. Will also owns a 16 oz steel handled Estwing for finished carpentry. By far the most popular hammer on the construction site. Estwing’s Solid Steel Claw Hammers provide unsurpassed balance and temper making then the go to general purpose hammer. The head and handle are forged in one piece which makes the hammer practically indestructible. with Leather or Shock Resistant Nylon Vinyl Grip. For technology and life time durability, its Liam’s hammer that shines. Great for driving nail after nail this hammer features IsoCore™ Shock Control System to reduce shock and vibration by 4X compared to other steel handle hammers. As wooden handles reduce muscle fatigue and joint pain, this steel handle hammer features the technology to do the same whilst offering the durability of a metal handle. The handle design fits your hand securely and comfortably, whether you’re choking up for precision strikes or swinging with maximum force, and strategic texturing helps improve grip while reducing blisters.